When it became his privilege to direct the movie version of the Les Misérables stage musical that has enthralled the world for more than a quarter-century, Tom Hooper made one crucial, momentous decision. Instead of following the normal practice of recording the songs in advance and having the actors lip-sync during filming, Hooper had them sing live. (A pianist accompanied them on set; the full orchestra was added later.) Freed from the duty of mimicking canned performances they'd given weeks earlier in a recording studio, the actors could now make choices in the moment, to adjust the emotion on this line or the delivery on that one according to how the scene was going. They could truly act. And act they do! Not the big, stylized theatrical acting you see in most stage musicals and movie adaptations thereof, but intimate, realistic performances, grounded in real human emotion. To take full advantage of this, Hooper made another unusual decision and filmed most of the songs in close-up, often in long, unbroken takes. It's better than a front-row seat on Broadway. It's more like being on the stage, staring Jean Valjean in the face while he vocalizes his inner struggles. There are trade-offs to this method, however, and while Hooper's version of Les Misérables is magnificent in many ways -- strengthened by all-in performances from Hugh Jackman, Anne Hathaway, Eddie Redmayne, and Samantha Barks -- it often feels curiously small in scale. That's what happens when so much of the story is told through close-ups and two-shots: you lose the sense that there is a bigger, grander tale unfolding. (That's especially problematic when the bigger, grander tale that's supposed to be the backdrop -- the French students' revolution -- wasn't that compelling on stage to begin with.) Hooper, who previously directed The King's Speech, gives us a few moments of eye-popping spectacle, but overall doesn't take nearly as much advantage of the opportunity as he could have. -- and on the word "brother," his voice cracks with emotion. That one small detail, that one acting choice by Jackman, speaks volumes about why the Bishop's kindness has touched Valjean so deeply: "He called me brother." I get teary-eyed just recalling the tenderness of the scene. Alas, Valjean's other chance to wreak emotional devastation on the audience, the soaring, plaintive "Bring Him Home," is neutered by several factors. It's too high for Jackman (and most people) to sing comfortably, and he's so focused on getting the notes right that there's no room left for acting. The scene is also hampered, as are many others in the second half of the film, by Hooper's poor sense of pacing, going steadily from one number to the next without pause or variation. We seldom get a chance to catch our breath, to contemplate what has happened. There's a lot of drama and tragedy to be squeezed in here, and while Hooper isn't rushing, exactly, he does tend to maintain the same fixed rate of speed. Sometimes it feels less like a story and more like a series of unrelated solos and duets. It muddies some plot points, too. Why is it a secret that Valjean rescued Marius that night at the barricade? Why is Eponine shown disguising herself as a boy when neither she nor anyone else is ever going to reference it? Why does Valjean decide he must separate himself from Cosette and Marius? I know the answers to these questions as spelled out in Hugo's novel and in the stage show, but if the movie were all I had to go by, I'd be in the dark. These problems are mostly in the second act, though. The first act has Valjean's aforementioned high point, as well as Anne Hathaway's grand-slam performance as the doomed Fantine. Her rendition of "I Dreamed a Dream," alive with heartbreaking emotion, is possibly the best combination of singing and acting ever captured on film. Others have sung better; others have acted better. But in terms of both at once, I can't think of a better performance. As Marius, Eddie Redmayne's high, quivering voice has imperfections, but it's full of character and conviction. Redmayne is committed to the emotions of his scenes, particularly in "Empty Chairs at Empty Tables," and his interactions with Cosette (a fine Amanda Seyfried, playing an underwritten character) and Eponine (the marvelous stage actress Samantha Barks) benefit from this. Barks' rendition of "On My Own" is a winner, too. Russell Crowe's Javert will be a little more controversial. Crowe has experience as a singer, fronting the rock bands 30 Odd Foot of Grunts and The Ordinary Fear of God, and he can carry a tune well enough. What he does with Javert is interesting. While most of the other characters sometimes talk-sing the more dialogue-ish parts of their lyrics, Javert always sings. Always. This is a subtle reinforcement of the character: a strict, traditional, unwavering man who does exactly what is expected of him. Yet it also hinders his ability to express Javert's emotions, which are crucial when it comes time for Javert to do the thing he eventually does. If the entire film were as good as the first 30 minutes, it would easily be one of the year's best pictures. Some of the later flaws come from the source material, but others are Hooper's responsibility. Still, the degree of difficulty in adapting such a large, beloved show is immense, and I'm grateful he and his collaborators pulled it off as well as they did. Most of the creative risks they took were successful, making this version of Les Misérables at once familiar to fans of the play and probably unlike any production they've seen. Les Misérables opens wide in the U.S. and Canada on Wednesday, December 25. Check local listings for theaters and showtimes. 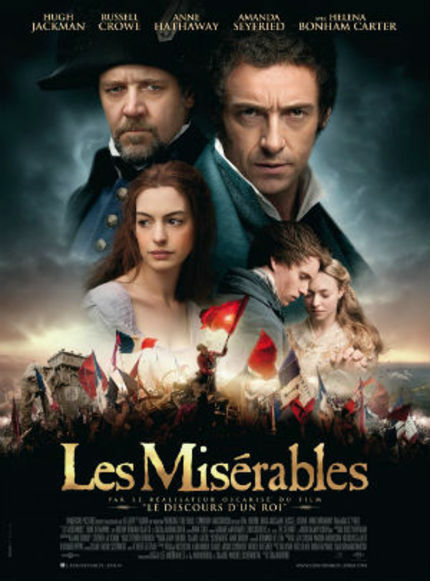 LES MISERABLES Gets New International Trailer!